Teen Wolf Scream Factory Blu-Ray Collector's Edition - with slipcover. Condition is Very Good. Shipped with USPS Media Mail. Sameday shipping ! FREE USPS Priority Shipping !! Teen Wolf: Season 5 Part 1 and 2 DVD. Teen Wolf: The Complete Season One (DVD, 2012, 3-Disc Set). Condition is Like New. Shipped with USPS Media Mail. Title: Teen Wolf 1 & 2. Format: DVD. Region: DVD: 1 (US, Canada.). Distributor/Studio: MGM (Video & DVD). Teen Wolf Too (Blu-ray / Collector's Edition) Widescreen Blu-ray presentation of the sequel film, plus bonus features. Or a curse?. New and factory sealed. Number of Discs: 1. Title Details. Title : Teen Wolf Season 4. Number of discs: 27. Rated: NR Not Rated. Subtitles: English, French, Spanish. 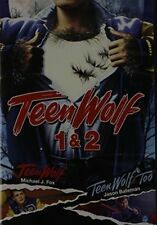 Teen Wolf/Teen Wolf Too Double Feature DVD NEW Michael J Fox Jason Bateman. Condition is Brand New. Shipped with USPS Media Mail. Item is like new. Watched maybe once. Perfect condition. Good condition. Includes all 3 dvds. Contains a cut on the front of the case. As pictured. TEEN WOLF SEASON 4 . Condition is Like New. Shipped with USPS Media Mail. Pre-owned, you are getting the Blu Ray disc only & paper cover only in sleeve NO PLASTIC CASE, disc in like new shape. Works great. All movies are original and genuine. Region: Region 1 (U.S. and Canada only. Read more about DVD formats.). We will make an effort to improve our services. Number of discs: 27. Format: AC-3, Box set, Color, Dolby, NTSC, Subtitled, Widescreen. Teen Wolf (Blu-ray Disc, 2011). Condition is Brand New. This item is brand new, but it is opened. I accidently ordered a blue ray and i dont have a blue ray player so I've never watched It. I'm an otr truck driver so I ask that you be patient with me get your item shipped. I'm home at a week at a time so please give me a week to get your item shipped to you. I will get it shipped ASAP. Thanks and happy bidding. 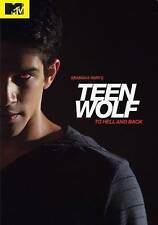 Now, with the help of best pal Stiles (Dylan O'Brien), Scott must try to lead a normal teenage life while keeping his newfound powers a secret from those around him. With Crystal Reed, Tyler Hoechlin. Attributes: Dolby, Subtitled, Widescreen, With Movie Cash. Title: Teen Wolf: Season 4. Format: DVD. Region: DVD: 1 (US, Canada.). Original Year: 2014. Original Language: ENG.